When Deputy Dakota Beck responded to a complaint about dogs running loose near a local property, she knew something wasn’t right. As she approached, she could smell urine and feces and heard barking from inside. She saw dogs in pens out in the backyard with matted fur. It looked as though they had been neglected for some time. She got a search warrant and returned later to investigate further. She found 31 dogs on the property in varying stages of neglect. Three of the dogs were in such poor health that they didn’t recover and died. But one of the rescued pups was extra grateful and must have sensed that Beck was there to help. 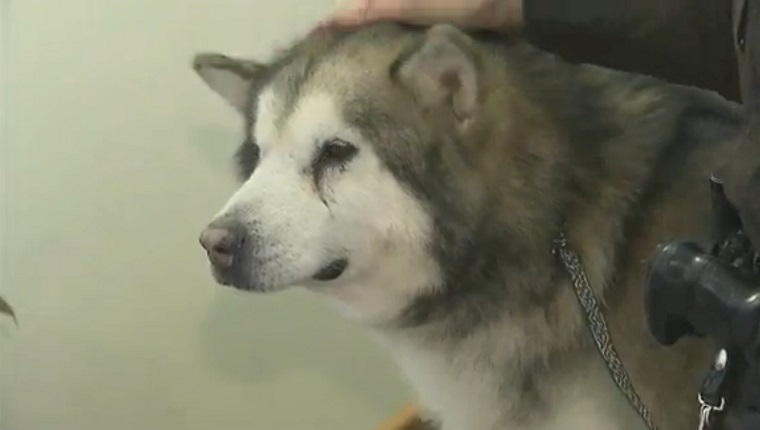 An 11-year-old, malnourished Alaskan Malamute bounded up to greet her. He jumped up and gave Beck a big doggy hug, and that’s when the deputy fell in love with the big pup. She named the dog Marty and after some time recovering with an animal rescue group, he was back to full health. Meanwhile, Beck, who recently purchased a home, decided that she was ready to add a dog to her family. She knew that Marty was the one and adopted him. Now the big, old pup lives with his rescuer. As for the former neglectful owner, she was charged with 28 counts of animal cruelty. The villain got defeated and the hero got the dog. What more could you ask for in a love story? Are you happy to see Beck and Marty together? Do you wish more officers would show concern for animals? Let us know in the comments below!